It’s soup season! I made my first pot tonight and even though I’m a warm weather gal, I am also crazy for soups. I’ll make two soups a week minimum. 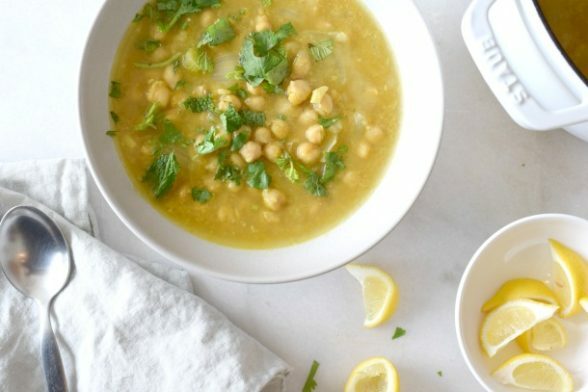 They’re easy, healthful, and so many rely on pantry staples, like this Lemony Chickpea Soup I developed for Clean Eating Magazine a few years ago. So flavorful, super rich texture, and loaded with fiber and protein! I am a huge legume fan, as well. Legumes are full of protein and fiber, low in fat, and they’re dirt cheap. Legumes are also really versatile. (Have you seen the White Bean Tahini Blondie recipe from my cookbook?) 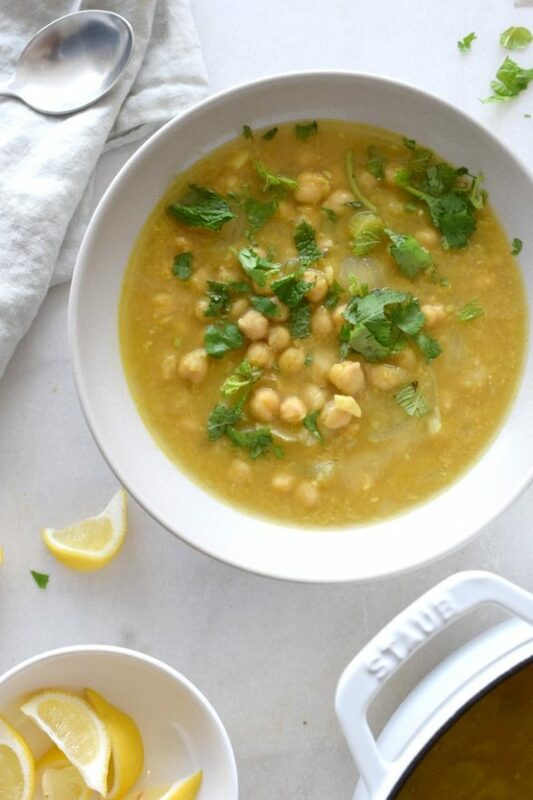 In this soup, chickpeas are pureed into a smooth a creamy base so you don’t need heavy cream or anything like that. I am barely keeping my head above water this week, so today’s post is going to be quick, just like this soup ;). Don’t skip all the great anti-inflammatory spices or the the squeeze of lemon or the fresh herbs at the end. I mean, Mr. Picky won’t permit green leaves floating in his soup, but he’ll eat three bowls of this without them. That’s a fair deal in my book! In a large pot, heat the olive oil over medium heat. Add the onion, celery and garlic and sauté until tender, about 6-8 minutes. Add the spices and stir until fragrant. Add the cooked chickpeas and toss to coat with the onion and spices. Add in the stock, salt, and pepper and bring to a boil. Reduce to a simmer and cook for 10-15 minutes. Puree a cup or two of the soup in a blender and stir back into the pot, or blend directly in the pot using an immersion blender. Taste for seasoning. 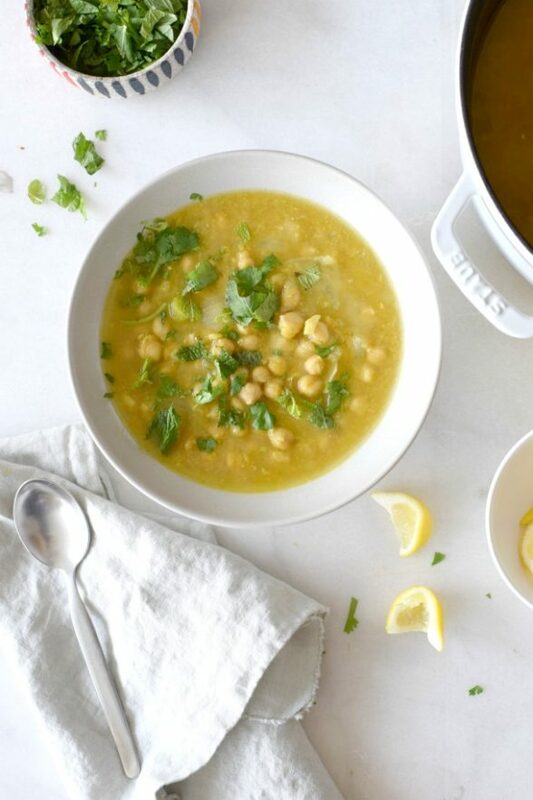 Divide the soup amongst 6 bowls, drizzle each with the juice of ⅓ lemon and top with ¼ cup mixed herbs. Oh my gosh made this tonight on this freezing night in nyc! Amazing so good & warming & healthy! Perfect for a chilly night! Glad it hit the spot! Love, love, love this soup!! Just made it and blown away by how easy and how tasty! Thank you!! Great, Lori! I agree — this wins the award for easy and tasty! Every time I make one of your soups, I think it’s my favorite. But I made this one again last night, and it really is my favorite!! Awww, thanks! I love this one, too. Tasty and easy – the best combo! I love the flavor, but I feel I personally need something else in it like rice or something? Any suggestions? You should add what you think you would like! Are you looking for texture? If so, after the soup is pureed you can add some chopped greens, peas, small cauliflower florets or some frozen veggies like green beans and carrots. Cook until heated through/tender! I love this soup! Do you think it would freeze well? I made this soup as one my meals for the week and it’s great. I can never have enough dill and lemon.